We thank all contributors and will feature these and other submitted photos in City publications and portcoquitlam.ca/photos. All photos featured in the calendar were submitted by community shutterbugs. The striking cover image was photographed by Mustafa Hassan and showcases scenic Blakeburn Lagoons Park, which opened in 2018 and was the subject of numerous submissions. One meal is enough to bring a bear back to your neighbourhood again and again. Secure attractants to keep your family and neighbours safe and avoid a $150 fine. More tips and info: portcoquitlam.ca/bears. •	Secure attractants in a garage or shed, or with an approved cart lock. •	Pick ripe fruit and berries and remove when fallen. •	Clean your barbecue after every use. •	Keep pet food and bird seed out of reach. •	Set out unlocked carts at the curb 5:30-7:30 am on collection day. •	Secure them again by 7 pm. 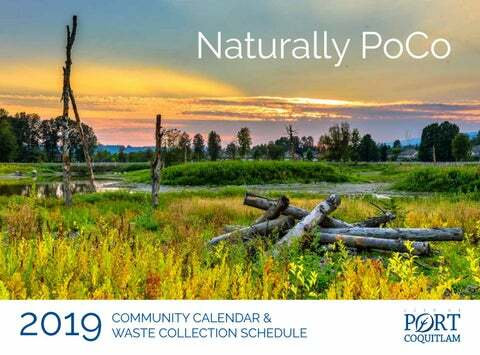 The calendars were also delivered to Port Coquitlam households in 100% biodegradable plastic bags. Please recycle this calendar at the end of 2019. Get the free app and never miss another pickup! Download the free PoCo Waste-Line app at portcoquitlam.ca/wasteline to: •	Get personalized collection reminders •	Use the Sort it Right! search tool to WASTE-LINE find out where it goes •	Report a problem with any City service •	Receive emergency notifications from the City •	and more! These items are often discarded incorrectly. Do you know where they go? Plastic bags and soft plastics NEVER go in your blue or green cart, even to hold other items. (Exception: Put shredded paper in SALAD a clear bag in your blue cart.) Most soft plastics are now accepted at the recycling depot. Soft plastics that still go in the garbage: Garbage bags, compostable/biodegradable plastics, bubble wrap and six-pack rings. Construction waste and treated or stained wood NEVER go in the garbage or green cart. Take them to the Coquitlam Transfer Station, 1200 United Blvd. Food waste and food-soiled papers (e.g. napkins and pizza boxes) NEVER go in your garbage cart. Put them in the green cart with your yard waste. Info: portcoquitlam.ca/greencart. Styrofoam containers and trays NEVER go in the garbage or recycling cart. Take them to the recycling depot. Electronics, power tools and small appliances NEVER go in the garbage. Take-back depots: returnit.ca/electronics for electronics, and electrorecycle.ca for small appliances and power tools. MONDAY A Year of Art Enjoy a new year of art at Leigh Square. Learn about upcoming exhibits: portcoquitlam.ca/ leighsquare. Get Active in 2019! There are plenty of fun ways for adults and kids to get active. Check out portcoquitlam.ca/ leisureguide for ideas! Celebrating Volunteers Port Coquitlam is celebrating volunteers during National Volunteer Week Apr. 7 to 13. Find out about local opportunities at portcoquitlam.ca/ volunteer. Earth Week How will you recognize Earth Week Apr. 16-22? Get ideas for living green: portcoquitlam.ca/green. APRIL City-wide Garage Sale Hold a garage sale with homes across the City on Apr. 27. Go to portcoquitlam.ca/ garagesale to be listed online. Sign up by Apr. 17 for free advertising. Learn about Our Past Find out about Port Coquitlam’s history and more – check out the latest exhibit at the Heritage at Leigh Square museum and archives. pocoheritage.com/ museum Stay Connected Want to stay up-to-date about your City? Keep an eye on our website, portcoquitlam.ca, and connect with us at portcoquitlam.ca/ connect. Chafer Beetle Info Are Chafer beetles infesting your lawn? View helpful videos and advice at portcoquitlam.ca/ chaferbeetle. Summer Camp Fun Fill those summer days with fun by signing up for our day camps for children and youth. experienceit.ca or 604.927.PLAY (7529). Taxes Made Easier Property taxes are due July 2. Save time: •	Pay via online banking. •	Use MyPortCoquitlam (portcoquitlam.ca/ myportcoquitlam) to view bills and more. •	Set up monthly tax and utility payments at portcoquitlam.ca/ prepayment. JULY Celebrate Canada Day Enjoy a pancake breakfast and fishing derby at Lions Park, then head to Castle Park for entertainment, a kids’ zone, firefighters’ salmon BBQ and fireworks finale. portcoquitlam.ca/ canadaday PoCo Grand Prix July 12 Join thousands downtown for the fourth annual PoCo Grand Prix presented by Dominion Lending Centres, featuring pro cycling, free entertainment and family fun. pocograndprix.ca Summer in the City Enjoy a summer of family fun with free movies at local parks, outdoor performances and more. Check the July and August calendars or portcoquitlam.ca/ summer. Hot Summer Nights and Block Parties Invite local fire crews to your neighbourhood gathering or block party: portcoquitlam.ca/fire or 604.927.5466. More info: portcoquitlam.ca/ blockparty. Stay Active This Fall How will you stay active this fall? Check out the fall Leisure Guide at portcoquitlam.ca/ leisureguide and register for programs and activities starting July 27. AUGUST Car Show Weekend Watch collector cars tour the City in the Car Cruise Aug. 17, then head to the main event downtown on Aug. 18 for hundreds of cars, entertainment, kids’ activities and more. pococarshow.ca Come Work With Us Interested in working for the City? 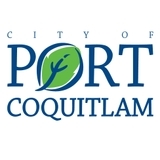 Find out about current job opportunities at portcoquitlam.ca/jobs. Check out Biz Hub Starting a business or developing a property? Biz Hub is a one-stop shop for business services and advice, at City Hall Annex (2564 Shaughnessy St.) or portcoquitlam.ca/bizhub. Know the Fireworks Regs If you’re planning a fireworks display, avoid a fine by applying for a Fireworks Event Permit before 3 pm on Oct. 31. 604.927.5466 or portcoquitlam.ca/ fireworks Clean Catchbasins Help prevent flooding by cleaning leaves and debris from catchbasin grates. Report damaged grates to 604.927.5496. Check Your Smoke Alarm When you set your clocks back Nov. 3, don’t forget to inspect, clean and vacuum your alarm, and change the batteries. portcoquitlam.ca/ firesafety Plan for a Green Holiday Think about ways you can reduce, reuse and recycle in the coming holiday season. Make sure you’re putting your waste in the right place. portcoquitlam.ca/ sortitright Youth Services Go to pocoyouth.com to learn about activities and facilities for local youth. Sign up for programs Check out the winter Leisure Guide at portcoquitlam.ca/ leisureguide and register starting Nov. 16. Seasonal Events Enjoy the best of the season at our fun events this month. Check out the calendar for activities. 604.927.PLAY (7529) or portcoquitlam.ca/events Holiday Hours Check the calendar or portcoquitlam.ca/ christmas for special holiday hours for City Hall, City Hall Annex, Leigh Square (The Outlet and The Gathering Place) and other City facilities. Renew Business Licences Business owners must renew their business licences by Jan. 2, 2020. Renewing is easy at portcoquitlam.ca/online. Extra Waste Pickup Check the calendar for extra collection days scheduled for your zone over the holidays.